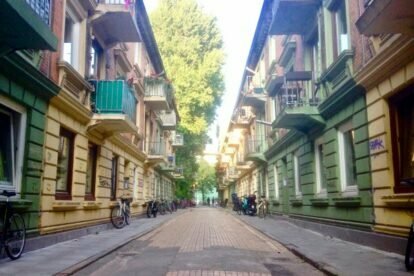 Karolinen Passage – Small idyllic street! One of the most idyllic streets bridges the Karoviertel with the fairground. The street is paved with what looks as if it was once used to be the tiles of a swimming pool. I like this type of street a lot, called a ‘passage’. Passage means that this once private street used to be a connection between two bordering streets (and it still is: you can get from Karolinenstraße –and Vetnameses restaurant XeÔm!– to Glashüttenstraße, which crosses the famous Markstraße – the main street in that district). In fact it might have been called a ‘terrasse’ as well, as you have to cross an archway through a building. Terrasses usually end up in dead ends. Both types of “streets” are typically found in this area of town. There are no cars in it and the residents are usually friendly and politically active against too much capitalism. Many of my friends live in the area or have one of the small stores on Marktstraße. Go and check it out!